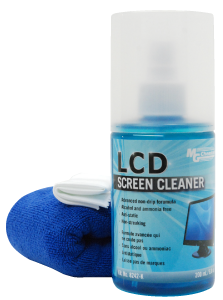 MG Chemicals LCD Screen Cleaning Kit includes a high quality microfiber cleaning cloth and an advanced Non Drip Gel formula that will safely and effectively clean the toughest residues from your LCD and Plasma screens. Directions: Spray cleaning gel solution onto screen or microfiber cloth. Wipe desired cleaning area until dry with microfiber cloth. Repeat if necessary. Do not spray out of intended area.